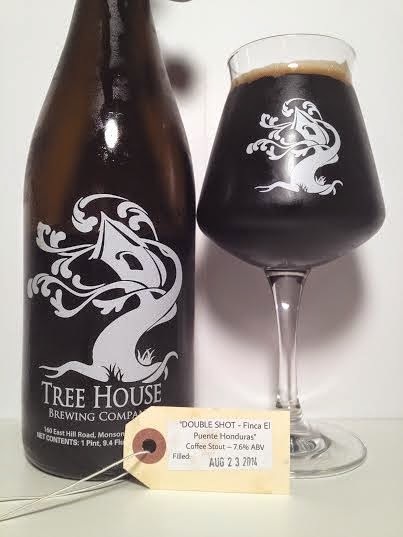 Back to Tree House we go for a look at a variation on their Double Shot coffee stout. Today I have Double Shot with Finca El Puente Honduras coffee coming in at 7.60%. I've had the standard Double Shot and other variations, but only in small samples, so this is my first full offering all to myself. As you can see above, this beer is pitch black with dark brown on the edges. It gave off a rich, creamy, frothy, mocha-colored head. This could be the most coffee-forward coffee stout I've ever smelled. Big espresso notes with subtle chocolate. Behind that is roasted malts with almost a wood finish and a faint vanilla presence. Basically a fresh cup of coffee with cream. The more common stout characteristics are there, but they are taking a backseat to the pungent coffee. Usually a coffee stout would leave some room for typical stout flavors, but this just assaults you with coffee, coffee, coffee. When consumed cold, it's reminiscent of iced coffee, but as it warms up you get rich coffee grounds and bitter espresso. There's almost a nutty flavor like a brown ale and I do detect a hop presence on the finish. Double Shot is fluffy on the tongue and despite it's coffee bitterness, it drink much lighter than a 7.60% stout - I just killed my 750ml growler in under an hour. Double Shot Finca El Puente Honduras is a fresh cup of coffee disguised as a stout. It's without question has one of the most in-your-face coffee flavors and aromas of any coffee stout I've ever had. While the coffee dominates so mich to take away from any classic roasted malt characters, this is a robust, flavorful stout and an excellent variation on an already great beer.